Update, March 2019: We’ve added lots of features and made significant improvements and updates since this announcement. Check our monthly updates or read more about sharing events from your Teamup Calendar. 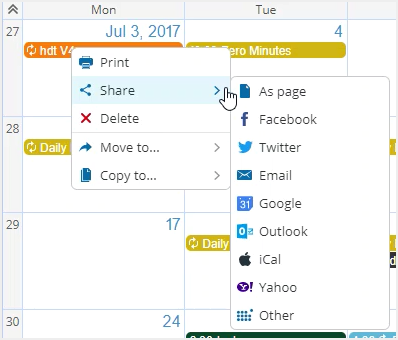 Each event on a Teamup Calendar can be shared via the Share menu. This makes it possible to make any single event entry accessible to users who otherwise may or may not have access to the calendar or any calendar link. It is also very easy to share a single event to the social media, or add to a personal calendar. Over the past months some users have asked to remove the option to share events directly to social media for good reasons. 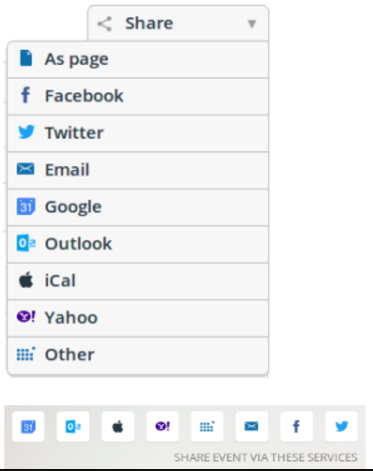 We have now also made the Share menu configurable so that you may turn on or off any of the Sharing options.